In response to the need to prepare its students for an increasingly modern and innovative society, the College will establish a new center for entrepreneurship as part of its $3 billion capital campaign, entitled “The Call to Lead.” The center, which will be named the Magnuson Family Center for Entrepreneurship, will serve as the official organizational structure for Dartmouth’s current and future entrepreneurial programming and resources, Dartmouth Entrepreneurial Network director and the center’s future director Jamie Coughlin wrote in an email statement. With an ultimate investment goal of $40 million, the College has already accumulated $36 million for the new center, which includes a donation of $20 million from Allison and Rick Magnuson ’79. Sixteen additional alumni have also contributed $1 million each to the establishment of the center. 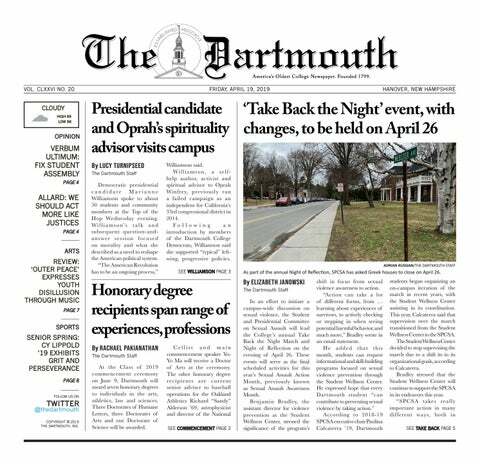 The donors comprise the Dartmouth Founders Circle. The new center will be located on the west end of campus in a new shared building with the College’s computer science and engineering programs. DEN was originally created in 2001 as a network of alumni affinity groups focused on entrepreneurship, but its vision and brand were broadened in 2013 to include new people, programs and resources, according to the Office of Entrepreneurship and Technology Transfer website. The new center will build on the opportunities already offered to current DEN members. DEN currently provides students interested in entrepreneurship ways to become involved in actual business ventures and meet notable figures in the entrepreneurial world. With the creation of the new center, there will be more financial support for students’ startups, according to Coughlin. Many proposed startups, such as the development of drone technology used to distribute medicine in underdeveloped areas of the world, address global concerns using modern technology, he said. The new center will facilitate innovative thinking, provide funding and allow students access to unique opportunities, according to the new center’s director Jamie Coughlin. Ge is a former member of The Dartmouth.